After booking my Bangalore-Ernakulam ticket, I was busy searching for return tickets. I had to reach Bangalore by Sunday night (since Monday was an important day in office). I wanted to try the new Conti Travels’ Volvo 9100 – they do not have online booking. So called their Coimbatore office and they replied that they did not have any seat. KPN Travels too was full on that day. I checked Kallada Travels’ Ernakulam-Bangalore bus, and that was full as well. It was after a long weekend – and hence the crowd was understandable. I checked Hindusthan Travels, and lo! They had tickets! I quickly booked a seat on the first row, and chose to board from Omni bus stand in Coimbatore. Now begins my search for tickets to reach Coimbatore from Ernakulam. There is only one day operator from Ernakulam to Coimbatore – Supaa Travels. They did not sell tickets online, but gave a phone number to contact for seats. I’ve notice that they usually reach Coimbatore only around 12noon – this would be late for me, since Hindusthan leaves from Omni bus stand at 1230hrs. The options left for me were Kerala SRTC’s Super Express and TN-SETC’s Salem Ultra-Deluxe. My stay in Ernakulam would be at Edappally, while TN-SETC has boarding point only at Ernakulam BS. They do not permit Ernakulam-Coimbatore reservations as well. 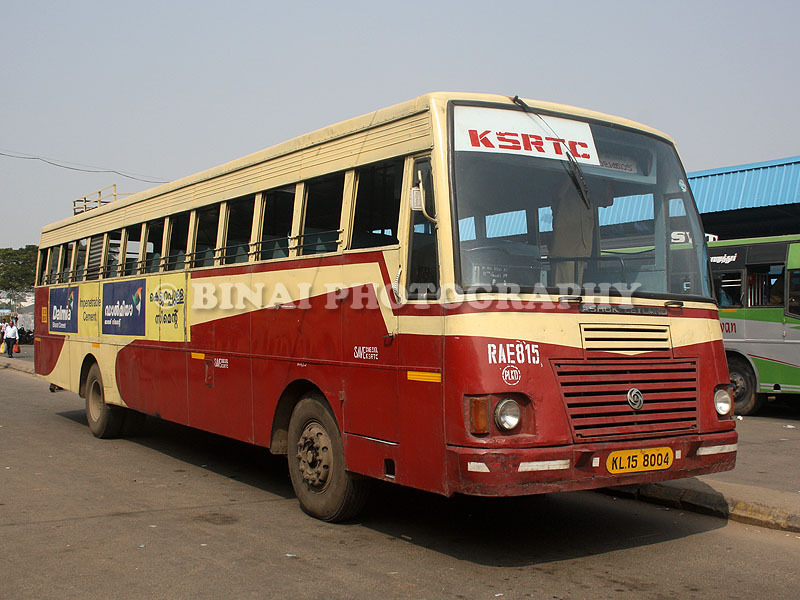 The only option left was the KSRTC Super express. I did not reserve online for some vague reasons. After the tiring journey by SRS (Read here), I was busy the entire day with various works. 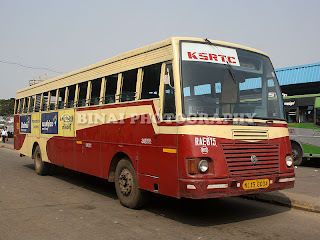 Sometime in the afternoon, I headed to the KSRTC bus station and booked a ticket at the reservation counter there. I returned home around 4pm, and immediately crashed on to the bed – woke up only around Dinner. After Dinner, I noticed that my phone had some 3-4 missed calls from a landline number in Ernakulam. I usually do not call back on seeing missed calls, but this repeated calls from a landline made me curious. 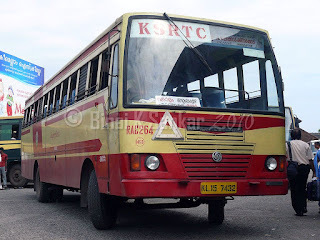 I called up – the person at the other end picked up the phone and said “Hello, KSRTC Ernakulam”. I was surely shocked. I told the person that I received some calls from this number. He immediately replied, “Have you booked a seat in the Super Express to Ernakulam?” “Yes”, I replied. He said, “Sorry sir. The schedule has been cancelled due to some technical reasons. We will provide you full refund against the ticket, and you may collect it from the reservation counter”. I thanked him to informing me, and disconnected the call. I was now wondering how I would make it to Coimbatore on time. I momentarily thought of leaving early from home and getting into the SETC bus from the bus station – but the thought of crawling for 5 hours to reach Coimbatore was not something I wanted. I hate the driving style of TN buses – they just keep lugging the bus all the time. 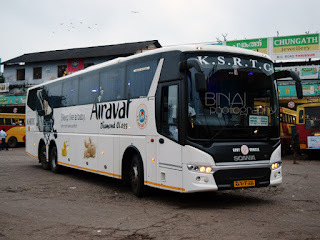 I used the KSRTC SMS service to find out some buses that leave in the morning, and I zeroed in on a Trivandrum-Mannarkad bus that leaves Ernakulam at 0530hrs. I woke up early that day, and was ready to leave by 0515hrs. I bid bye to my hosts and started walking from home at 0525hrs. The place was around 0.5kms from Edappally bus stop – I had a brisk walk towards the bus stop – reaching there by around 0535hrs. Just after I reached the bus stop, an FP to Munnar and a Super Fast to Guruvayur (via Kodungallur) came in. Just behind these buses, another super fast was seen – that was the Mannarkad bus. It was RAC264 of Mannarkad depot. The fairly aged-but-young bus was decently crowded – I did not find any seat, and had to stand. The bus started from Edappally at 0543hrs. Most seated passengers were fast asleep – and all the windows were closed. It was fairly cold outside and hence the temperature in the bus was comfortable. We reached Aluva bypass at 0555. Some passengers got in from here. We reached Ankamaly bus station at 0607hrs – lot more passengers got in. Now, the bus had good crowd. Just as the bus neared Chalakudy, a lot of passengers got ready to get off. The first row of three-seater got vacant – and some people rushed to take the seat. I did not rush – that seat is reserved for ladies. Thankfully, another “three seater” at the place I stood also vacated – I grabbed the window seat. We reached Chalakudy at 0625hrs. Some empty seats were filled, while some more standees got in. When the bus stopped at Koratty, a few ladies got in – the three proud gentlemen who grabbed the first row seats now had to vacate their seats. The bus did not enter Pudukkad bus station – we rushed past through the highway. We reached Thrissur bus station at 0700hrs. I got off the bus to have tea and some snacks. There was one bus to Coimbatore parked in the next track – but that one was full. I did not want to travel standing again. The crew did not want to have breakfast at Thrissur – we started off at 0711hrs. The driver went ballistic after Thrissur – he did not care for the bad roads. The driving was typical KSRTC style. There was a minor block at Kuthiran – due to the narrow bridge at the foot hills. We reached Vadakkencherry at 0805 hrs. Super fast buses do not enter the town, but stop only at the highway. Our next stop was at Alathur – 0816hrs. Finally, the bus reached Palakkad at 0844hrs. 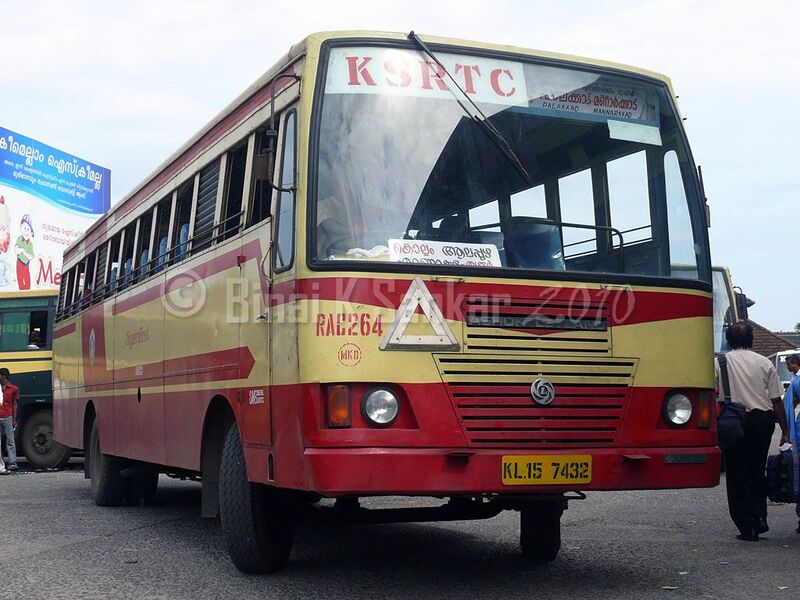 Two KSRTC buses to Coimbatore were parked outside the KSRTC canteen in Palakkad – one was RAE331 (of Thrissur) and the other was RAE332 (of Palakkad). Both were full. 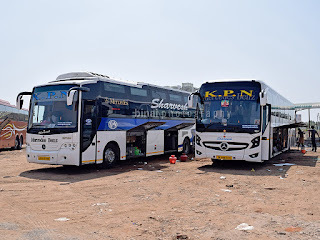 The inter-state departure bay of Palakkad bus station had one SETC (with Coimbatore board), two KSRTC 12M Fast Passengers and one TNSTC as well. I decided to take the first 12M bus – that was RAE815 of Palakkad. This bus was literally empty – I was actually the first passenger to board this bus. That SETC to Coimbatore was still loitering around trying to get passengers. The crew in my bus was happy – those guys were running in KSRTC’s slot and were soliciting more passengers. Finally, the KSRTC security crew intervened and made the SETC guys to leave the bus station. We waited for some more time to make up some gap. I had taken the hot seat – the first row seat on the left side. In 12M Fast passenger buses, that is a double seat. We left Palakkad at 0850hrs – this was my second fastest connection at Palakkad. RAE815 of Palakkad, at Ukkadam. We overtook that SETC bus just after Chandranagar bypass itself! We had about 75% occupancy by now. The driver maintained fairly good pace all the time. I found out that this bus was a “stay” bus – their duty starts in the evening, then work trips upto night. In the night the bus is parked at Palakkad depot and the crew restart the next morning. They sign off past noon. Traffic picked up after Chavady, slowing our progress significantly. The bus finally pulled into Ukkadam BS at 1015hrs. My end-to-end travel time was 4 hours 32 minutes – including a bus change! Edappally to Palakkad took only 3 hours and a minute (Edappally to Thrissur was 1:17hrs and Thrissur to Palakkad took 1:33hrs) Palakkad to Ukkadam took 1:25hrs. 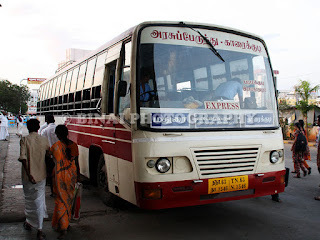 Getting a bus from Ukkadam to Gandhipuram was a royal pain – it seems they had modified that dedicated Ukkadam-Gandhipuram bus (#150 – this is a very old service, launched sometime in the mid-90s. It was initially called “JJ” – Junction-to-Junction, and later renamed as “PP” – Point-to-point. The route got a number only sometime in the past 3-4 years). In the older days, Ukkadam-Gandhipuram had fairly frequent services – the buses on that route used to have a characteristic livery (blue diagonal stripes with yellow route boards) in the olden days. Later the livery went, and now the service itself has been modified. After wasting some time waiting for the direct bus inside the bus station, I decided to take a bus to Railway Station and then change over to another one from there – this journey was really expensive. Ukkadam to Railway station cost me Rs. 7 and Railway station to Gandhipuram was Rs. 9! About 4 years back, I remember travelling Ukkadam to Gandhipuram for Rs. 5! The review of Hindusthan Travels, coming up soon.